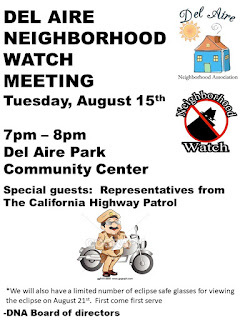 We will have our next Del Aire Neighborhood Watch Meeting on Tuesday, August 15th @ 7pm. 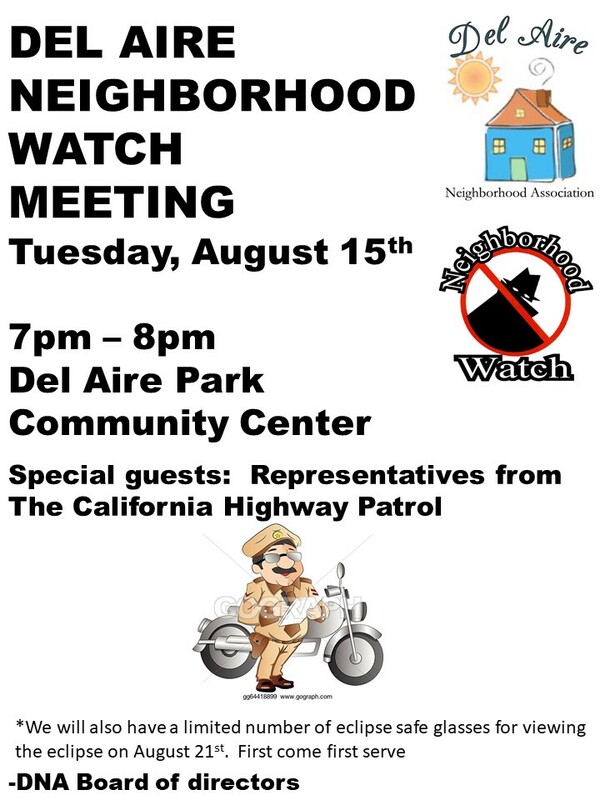 We invited the California Highway Patrol to attend the meeting and answer some of your questions. They were unable to attend the last meeting, so we can hope that they will join us for this one. Thanks to our good neighbor, Travis, we will have a limited quantity of eclipse viewing glasses for the eclipse on August 21st. First come, first serve. As we are about to start a new school year, some of us may know of some college bound freshmen women. This is an exciting and dangerous time period for our young women. Please be aware of the phenomena known as THE RED ZONE. This is a period at the beginning of the school year where freshmen women are most vulnerable to sexual assault. 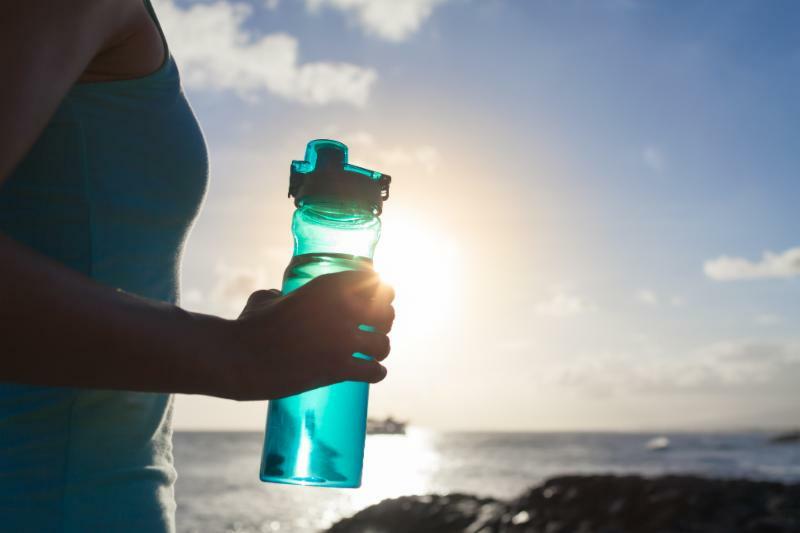 Join us on Saturday, August 12 at 9:00am to learn how West Basin is exploring responsible ocean water desalination to diversify the district's water supply portfolio, increase water reliability and protect our marine ecosystem. Disclaimer: In our ongoing effort to improve the efficient operations of the facility, major construction will be taking place on the facility premises starting January 2017 and will continue through the end of the calendar year. 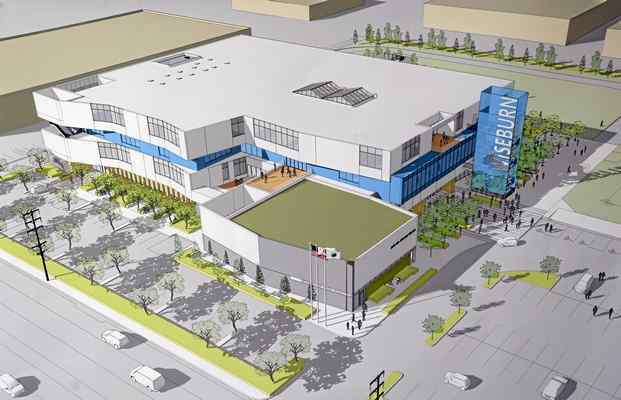 Due to the construction activities scheduled the week of this briefing, a tour of the facility may not be possible. We will keep you updated. Thank you for understanding. If you have any questions or concerns please feel free to call our tour hotline. Email info@westbasin.org or call our tour hotline at (310) 660-6243. Free parking available in front lot.